One of the main trails in Black Rock Mountain State Park is the Tennessee Rock Trail. This trail goes thru a variety of wild plant habitats. 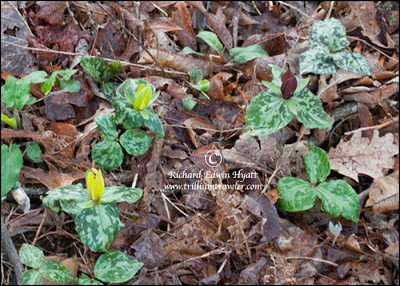 And, in places here is an abundance of trilliums, as well as, other wildflowers and forests. Here are similar trilliums but, as you look closely the color of the flowers are not the same.